A fantastic experience of violence and pitch black humour, Inbred is distinctly British and distinctly Alex Chandon. It has been ten years since Chandon directed Cradle Of Fear, and the nightmarish quality of that 2001 cult favourite has been retained in Inbred and fortified with a more consistent cast and superior production values. The director’s latest offering to the horror genre pitches a group of troubled teens and their youth workers against a freak show ensemble of murderous villagers in rural Yorkshire. A trip to the local pub on their first night introduces the locals and sounds the warning that all might not be well – and are those really pork scratchings? From here fortune swiftly plummets for the unfortunate gang as they are exposed to bizarre and sadistic local customs which would make the inhabitants of “Summer Isle” seem welcoming. 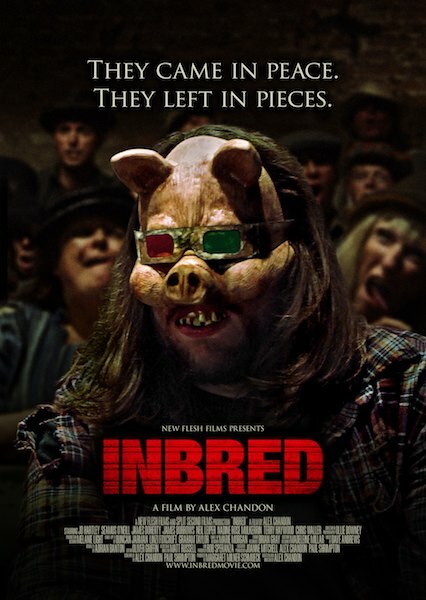 The acting in Inbred is solid throughout, and the cast had clearly been selected to give the correct feel for a film which is designed to function as an effective horror movie (which it does) whilst not asking its audience to take it too seriously. Jo Hartley and James Doherty as the group leaders perform particularly well together: he the overly liberal youth worker trying to relate to the kids but failing miserably, and she the harder-nosed realist who coaxes tentative friendships from them. Their dynamic aided the younger actor’s interactions and provided humour and characters which were easy to identify with. It was interesting to see a quintessentially American horror subgenre (out-of-towners entering the isolated domain of murderous hillbillies; see Wrong Turn et al) transposed into the English countryside. It was done well and took the correct tone to avoid the potential pitfalls: principally the scale of the landscape and likely proximity to civilisation, which could have been problematic. 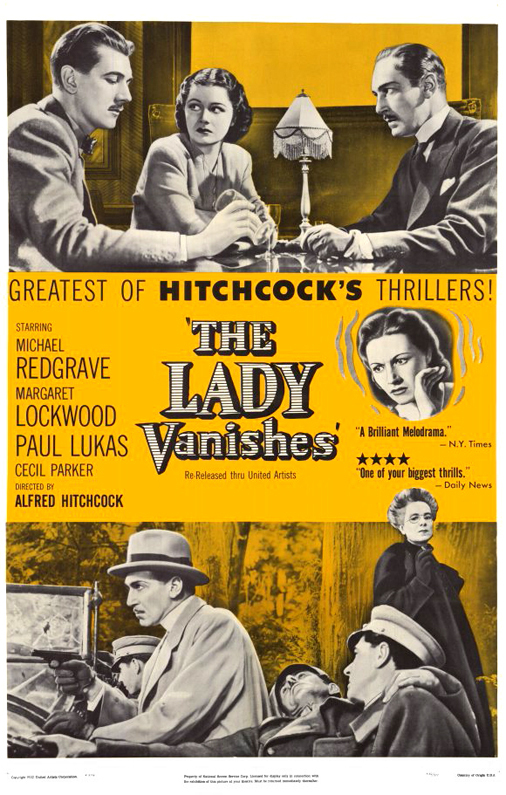 The humour allowed the viewer to suspend disbelief further than in a straight piece, but it was never allowed to become a slapstick farce – the balance was well struck. As with Cradle Of Fear the physical effects were extremely well executed. True horror aficionados love practical effects, and with a plethora of gore including slit throats and blown-up heads, genre fans will find themselves roaring with approval once the action gets started. If CGI was used, it was done so sparingly and effectively. Inbred does not simply provide the set-up and then unleash horrors upon its victims; instead a surreal community and its unique brand of underground entertainment is fleshed out before the carnage begins. If you’ve ever been to a tiny, isolated, village and wondered “what do they do for fun here?” – Inbred takes that thought and then brutally murders it in front of a cheering crowd by way of an answer. Gratifyingly, directorial courage was not lost at the conclusion of Inbred. The violent attrition between the opposite sides of the rural divide was bloody and fun. The ending satisfyingly concluded the film in the tone it deserved – you wouldn’t expect all the protagonists walking off into the sunset together, but neither are we ambushed with an Eden Lake style buzz kill. Again the tone and balance were well crafted. Sometimes the success and failure of a movie is not entirely down to the filmmakers, but the audience too. Watching Inbred for an in-depth exposition on rural life in modern Yorkshire would be a bit like watching Carry On Doctor for an insight into the workings of the NHS in the 1960’s. With grass roots horror at its black heart and a sick sense of humour, Inbred entertains from start to finish and will put an evil smile on your face. Hopefully Alex Chandon won’t leave horror fans waiting another decade before returning to the director’s chair. 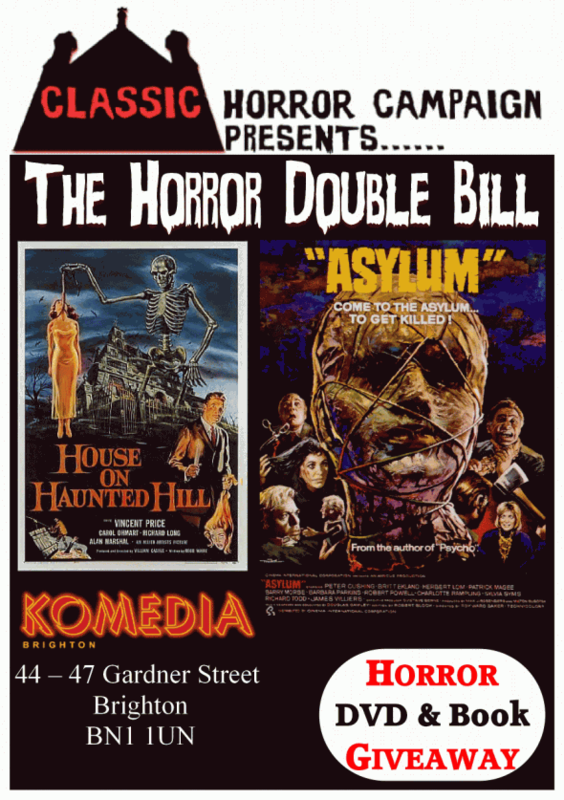 British & European Horror News – Episode 65. Mum & Dad is an independent British horror film set amongst the austere backdrop of London’s Heathrow Airport and the constant drone of jet engines. The area is bleak and characterized by fences topped with razor wire and depressing homogenized rows of terraced houses which have depleted as the airport grew up around them. Each abode is the same as the next – but one of them hides a pair of serial killers: Mum and Dad. Lena is a polish girl who works as a cleaner at the airport. She shares a shift with Birdie, who despite being light-fingered and a gossip, seems likable enough. Birdie introduces Lena to Elbie, her “adopted brother” who is a mute and also works at the airport. At the end of one shift Birdie orchestrates a situation whereby Lena misses the last bus, and insists that Lena comes with her so that her Dad can give her a ride home. Of course this never comes to pass, and after arriving at Birdies house, Lena is bludgeoned and drugged – awakening some time later to the start of a hellish surreal nightmare that she may never survive. At this early stage in the film’s progression, the viewer could be forgiven for thinking that the plot is setting up a scenario seen regularly in copy-cat films since the success of movies such as Saw and Hostel. 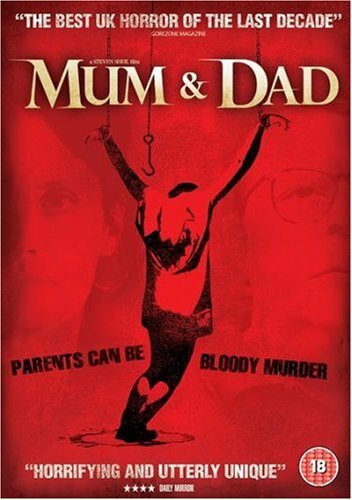 Whilst Mum & Dad does not shy away from extremely sadistic and nasty violence, it is not a gore film and instead relies upon creating a horrifically bizarre environment which is ruled over by the most deranged of minds. The fear comes from our empathy with Lena, and our vicarious terror is ratcheted up with every scene in this terrible scenario. This empathy comes from Lena being a brilliantly written and acted character. For all the budget constraints involved with British independent film-making, it usually excels at the fundamentals – such as writing, acting and characterization. Lena is smart but still bound by realistic human character traits. She does what the viewer would do in many situations, or at least she does not do anything distractingly unbelievable – it’s a nice change from the idiots some mainstream horror would usually have us cheer for, or indeed the heroines who suddenly become almost superhuman when under threat. It is made abundantly clear that Mum and Dad are serial killers – but very different to each other in their psychopathic tendencies. Dad is a violent sexual predator who likes to murder in fits of rage, whereas Mum is a true sadist who likes to torture with finesse for the physical delight it brings her. Dad enjoys to hack and bludgeon, Mum favors the use of spikes and knives – they are both homicidal lunatics. Lunatics they are beyond doubt, but within the fortress of their own home they have created a world where their manner of living is completely normal. They acquire “children” and this is why Lena finds herself captive. Her “adopted” brother and sister (Birdie and Elbie) have become totally immersed in this culture and accept it as a standard existence. In one scene the rest of his family patiently wait for Dad to finish pleasuring himself into a hacked off chunk of human flesh before they introduce him to Lena; once he is done, Dad tells her that “family is everything”. Family breakfast’s see dismembered body-parts brought out for disposal whilst people eat toast. Pornographic movies play on the TV and Dad inappropriately kisses and gropes Birdie (who reciprocates) before settling down with the morning paper. Every aspect of this film superimposes the normal with the deranged, and this unhinged atmosphere is the signature of the movie. This is aided by the stand-out aspect of the production – Perry Benson’s performance as Dad. Benson is a stalwart British actor and carries the film with both his appearance and the portrayal of his character. His hateful, twisted and completely unbalanced delivery is terrifying to behold. The writer and director of Mum & Dad (Steven Sheil) describes it as “a fucked-up-family film”. Succinct as this summary is, it doesn’t even begin to do justice to the horror of this movie. Lena is completely at the mercy of a matriarch and patriarch whose lunacy now controls her entire existence, if she fits in and does not cause a problem she is told that she will be fine – if not there will be Dad to answer to. “Fine”, of course, in this instance is relative! The unsettling torment of Lena’s predicament is sharply focused in the knife-edge balance of her captor’s insanity. Using the language of a normal parental unit, the actions of Mum and Dad are starkly juxtaposed. Calling Lena “her angel, sent from heaven” mum inserts spikes through her skin and lacerates her with a scalpel – all the while telling her to keep Mum happy so as not to upset Dad. Playing it smart and trying to stay on the good side of Mum and Dad until a suitable chance of escape or rescue presents itself, Lena incurs the increasingly bitter resentment of Birdie who dreads the inevitable result of not being Mum and Dad’s favorite anymore. Lena now has to fear her new parents as well as some particularly twisted sibling rivalry as the tension reaches stratospheric levels towards the film’s conclusion. Mum & Dad was made under Film London’s “Microwave” project, where the budget is capped at a maximum of £100,000. This is a miniscule amount of money on which to shoot a feature and it is to the credit of all involved that what was produced looks and feels like it was shot on ten-times that budget. Moreover, the result was a gripping and terrifying film that exemplifies all that is good about British independent horror cinema. If you want a well crafted horror film that is brilliantly acted, full of threat and tension, claustrophobic, violent and completely deranged – Mum & Dad comes highly recommended.